If you are looking for a contemporary fireplace style that will help heat your room, then this wall hung electric fireplace certainly fits the bill. There is an excellent view with the 50 inch wide screen, and the realistic looking flames will soothe and provide a cozy ambiance. It is different from other fireplaces, and that is why a lot of people love it. The flame effects on the Dimplex BLF50 are Dimplex’s own patented 3D flame effects, which are unique to the company. There is no brightness or intensity adjustment for the flames. The flame effects are LED powered and these LED’s never require changing. They are very realistic looking yellow flames and create the illusion of a real fire. It has a glass ember bed which adds to the overall effect. It provides a very nice ambience and the flames are very soothing. The flame effects are operational with or without the heater function. 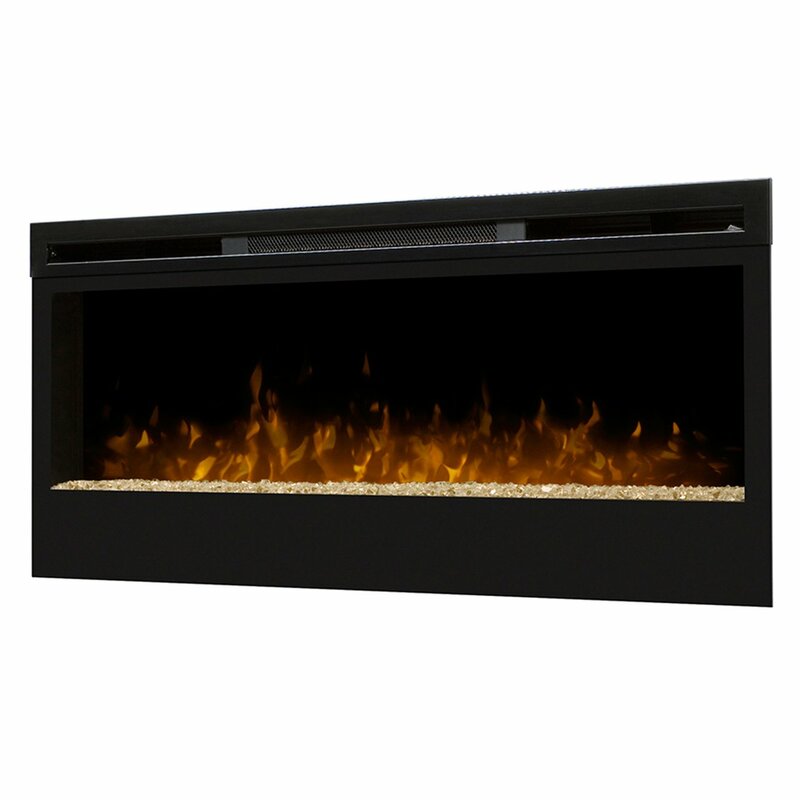 Dimplex has, arguably, the best flame effects in the electric fireplace industry. The heater is situated at the top of the fireplace and is of the louver less, fan forced air circulation type. The heater is fairly silent when it is operating, and there are three heat settings for low heat, high heat and no heat. The heat output from the heater is 4198 BTU’s at 1000 Watts. A power cord is supplied with the fireplace, and this plugs into a standard 120V electrical outlet. The fireplace can also be direct wired. It is designed to warm a room up to 400 square feet. There is an automatic cut off function if the heater overheats. The Dimplex BLF50 can be controlled from the manual switches which are located at the top right of the fireplace, or the remote control which is supplied with the unit. There is a 3 position switch with the manual control panel, and this changes the mode that the fireplace operates in. When the 3 position switch is set to “Manual” mode, the three levels of operation are only accessible with the manual controls. If it is set to “Remote” then only the remote control can change the fireplace settings. The third option is the “Off” mode which removes the power. The three levels of operation for the fireplace are flame effect only, flame effect and low heat and flame effect and high heat. For both the manual controls and the remote there are 1 and 0 buttons. Each time the “1” button is pressed the fireplace will change modes. If the “0” button is pressed the fireplace will switch off. The remote control will work up to 50 feet away from the fireplace and is not affected by obstacles in the line of sight. The feature that was most frequently complimented was the flame effects. Many enjoyed the flame effects, and how the fireplace provided a real centerpiece for the rooms that it was installed in. There were other comments about the flames being very relaxing and providing a cozy atmosphere. One customer said that the 3D flame effects were much better than the normal 2D effects and “made all the difference in the world”. The style and design of the Dimplex BLF50 was commented on a lot, favorably. A number of customers said that their visitors had told them how elegant the fireplace looked. Some said the fireplace was “gorgeous” and that they just loved to look at it. There were lots of positive comments about how easy to install the fireplace was. Some said that the instructions were very easy to follow. One customer hired a contractor to install it and it only took an hour to fit. There were a few comments about how easy the fireplace was to operate. The remote control worked well and it was very intuitive. There were a few customers who really liked the fact that the fireplace could work in flame effect only mode without the heat. A number of customers commented on how well the heater performed and that it warmed their rooms. One customer remarked that it heated a 600 square foot room adequately. Another customer was particularly complimentary about the fact that the front surface of the fireplace never gets hot, and there is no danger that children could burn themselves if they touched it. There were a few customers who felt that the installation of the fireplace was difficult. We think simply hanging it is easy. If you opt for partially recessed or a flush mount you will be into taking a wall apart, building a box, and bracing studs. This takes being somewhat handy and having the right tools..Difficult installation was certainly not the majority view. One buyer commented that it was very easy to break the safety glass in the front of the fireplace. This broke when the fireplace was being moved. There was only one complaint about this. There were a few complaints that the heater did not provide adequate heating levels. The customers did not specify the size of the rooms that they wanted to heat. Again this is not considered to be a major problem and it was contrary to the majority view. Quite simply most electric fireplaces will not heat your whole house. This is not a downfall of any particular fireplace heater. The limitation is a function of how much power and electricity can be pulled through a standard household circuit and outlet safely. It is true for almost all electric fireplace heater components. The fireplace measures 50.2 inches wide by 7 inches deep and 19.5 inches high. It weighs 80 pounds and is finished in black. There are full installation instructions provided with the fireplace. Of all of the reviews for the Dimplex BLF50, 73% of them awarded a 5 out of 5 star rating and 15% awarded a 4 out of 5 star rating. This is 88% overall. There were no 1 star reviews for the product, and very few negative comments at all. The negative comments that were received were not considered to be major issues, and should not put you off purchasing this fireplace. The Dimplex BLF50 has a wonderful modern look and will be the centerpiece for any room in your home. The 3D flame effects are very realistic, and the heater output is good. If you want to add style to your home then the Dimplex BLF50 is a very good option. This fireplace is highly recommended. Dimplex Synergy Linear Wall Mount Electric Fireplace Review.